Mod. 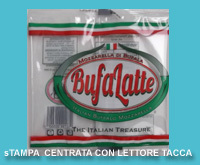 Compatta: su ruote per buste-cuscino da 200/500/1000 gr. 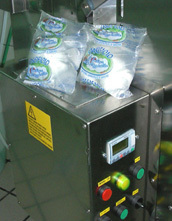 Linea automatica per buste-cuscino da 200/500/1000 gr. 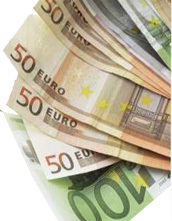 Oltre la qualità il nostro segreto è il "prezzo"
Data di produzione - Scadenza - Lotto - Conteggio - Codice a barre. 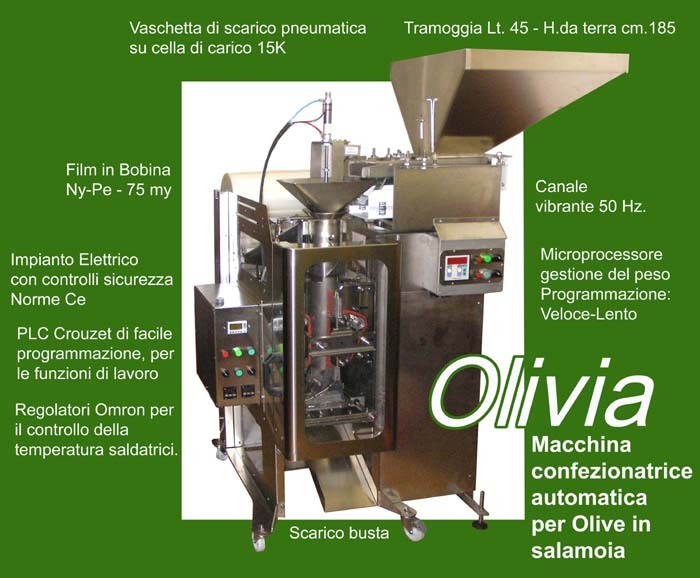 MicroJet è ideale per stampare direttamente su film plastico, etichette, cartoni e ed involucri di prodotti alimentari e farmaceutici. Le possibilità di applicazione sono infinite. 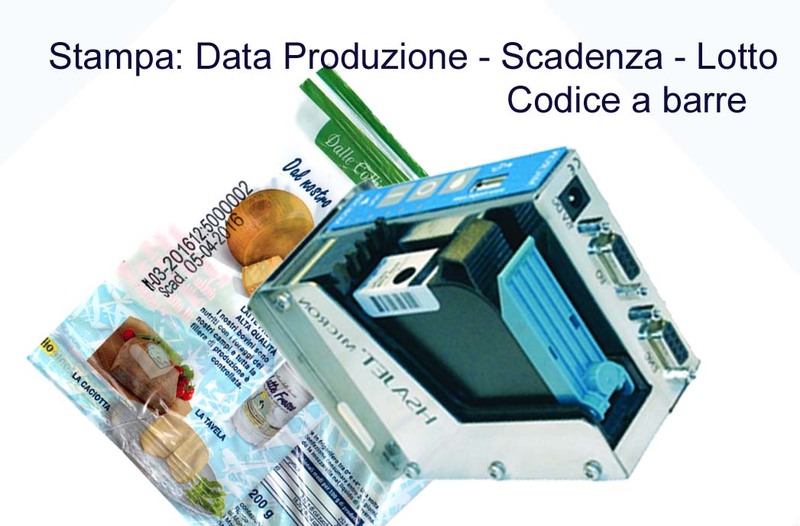 Con il software a corredo della stampante, molto semplice ed intuitivo è possibile progettare con il proprio PC: Logo, scadenza, data di produzione, conteggio crescente o decrescente dell'imballo, salvare i dati su apposita penna USB e trasferirli nel MicroJet. 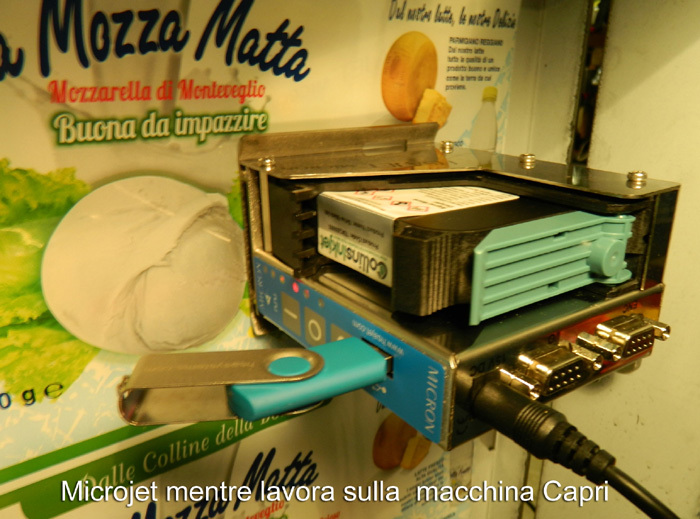 La stampante completa di apposita cartuccia di inchiostro è pronta per il lavoro semplicemente azionando il pulsante di avvio..
Cartucce: è possibile utilizzare qualsiasi cartuccia d'inchiostro HP come le Spot Colors, UV colors oppure Fast Drying. 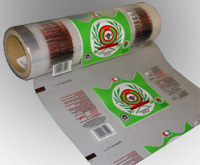 (Da scegliere secondo il materiale del supporto) La tensione di lavoro delle cartucce può essere impostata durante la creazione del layout. Macchina confezionatrice verticale di mozzarella, bocconcini etc. 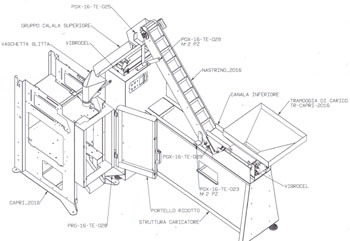 Progex engineering, constructs imbustatrici cars, confezionatrici it has developed the new plan “Capri” dedicated to the small business and to the craftsmen who wish to organize a job in economic way, with a equipment simple to use and the minimal investment. But because it is convenient ...............? 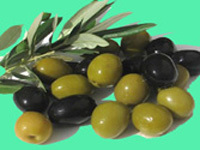 Capri is planned in order to be used in atmospheres little ones. 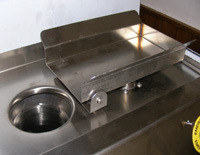 Measure to the base cm.80x95 and a height of 140 job of cm. 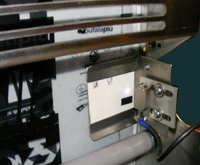 is mounted on wheels for which it is easy spostabile.in every angle of the premises. It does not exist, on the domestic market and foreign a car of characteristics similar to an exceptionally competitive price. Componentry in stainless steel, easy washable, produced with the concept “Planning the event” that through the planned maintenance and the control of the system it leads to the maximum efficiency, it increases the production and it reduces the arrest warrants plot. 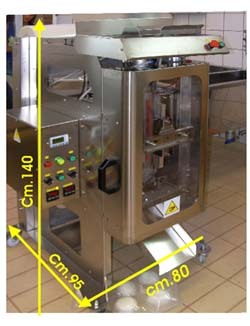 Capri can work in cheese factories of small dimensions. Electric power supply 220 v. single phase - 1600 Wa. 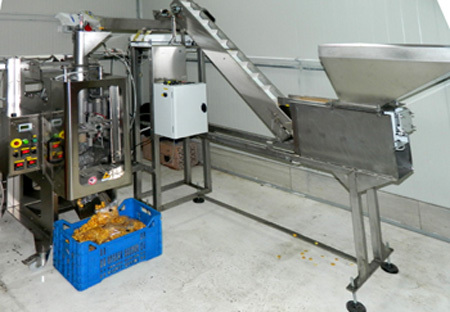 it is equipped of tank to pneumatic drive for the feeding of the produced one. The phase of drainage determines the cycle previously automatic rifle respecting the set up times on the PLC. On the frontal belt the start button is situated cycle is the emergency for the fast interruption of the working cycle for circumstances or random events. Operation: The produced one is placed on the cargo tank. 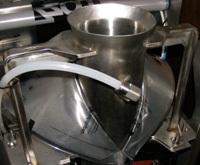 The tank to every working cycle overturns, and directly inserts the content in the mold preparation tube. 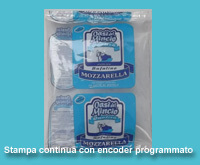 They can be manifactured single pieces or multiples (es: bocconcini) Slipping without to endure stress (graces to appropriate sagomature of the convogliatori) the produced one crosses the tube while the pump generates the programmed amount of the government liquid. 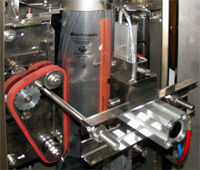 Traction of the film with cinghioli motorized on flange adjustable for the just pressure. 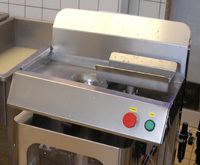 Easy removable 24 motors V. DC for cleansing and maintenance. 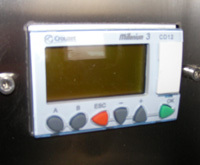 The encoder it is an electronic counter to vhf, to gears, of series on all the versions of the HappyCapri. 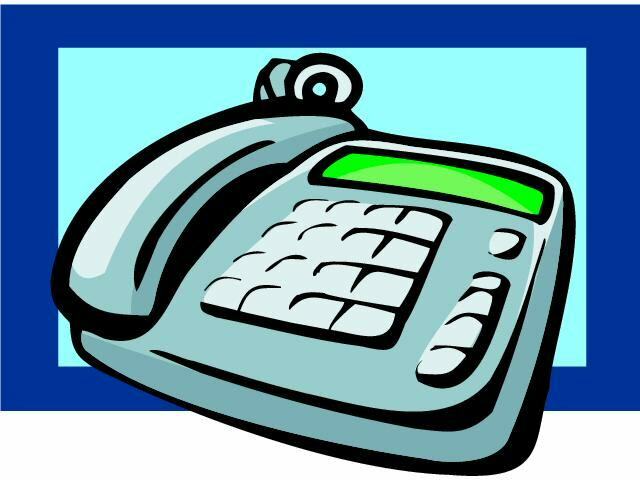 It communicates directly with logic of the PLC and allows, setting up a numerical, greater entity or a minor length of the envelope. 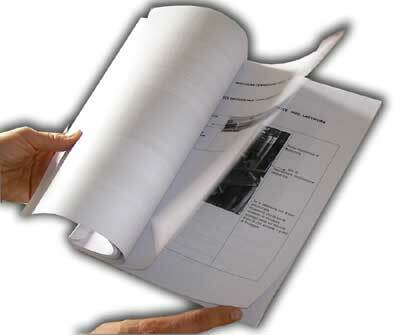 It is of high precision and it assures a constant dimension of the produced envelopes. 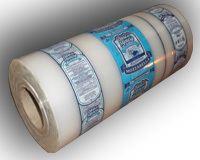 It allows I use it of neutral films (without prints) or film with “prints continuous” 'so as to be able to use the same coil mounted on the car in order to produce to confection with weights and various dimensions. 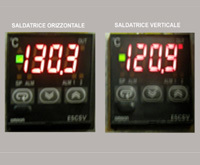 The reader of centered notch is a device that a printed publication in the margin of the coil reads and allows to regulate the welding system so that to produce envelopes with logo and perfectly written reference. He is not advisable for small productions to cause, of the approviggionamento of the film. In fact Kg) for every single system (regarding the dimennsioni and the largeness of the produced one is necessary to order quantitative minimal (approximately 300 to manifacture, for which it increases the film lying in warehouse. PLC Crouzet of easy programming - It manages all the functions of the car. “The car, from the date of confirmation of the order, is always available in four weeks. Guarantee 100% for an entire year. For a reciprocation urgent: fast delivery in 24 h.
To make it to work is easy.